The pyramidal structures are found from all pockets of ancient civilizations fairly spread throughout the world. The holy shrines of Ziggurats of Central Asia, the Pyramids (memorial tombs of the dead) of Egypt, the shrines dedicated to Sun-god of the ancient Mexican civilizations which continued till as late as the coming of the Europeans, the Buddhist structure depicting the ‘ascent of the man’ at Borobudur of Indonesia and the replica of Mount Kailas (Maha Meru) which is commonly worshipped in the Hindu households as a symbol of Sri Mahalaxmi and the architecture of Hindu temples are enough examples to establish the commonness of the pyramidal shape for the holy shrines or objects of worship throughout the world since times immemorial. Irrespective of the difference in the meaning, purpose and ritualistic practices followed by various religious creeds, the philosophical basis of the pyramidal shape of these structures or symbols of worship could be understood hypothetically from the moorings of Aryan Culture. These pyramidal structures symbolically represent the Brahmaanda, which comprises of fourteen Lokaas facilitating the ascent of jiva. The Brahmaanda Puraana offers clear description of the structure of our Brahmaanda. The architectural styles of these structures at various places might differ from each other. Some are cubical at the basement and conical or cylindrical or pyramidal at the top. Some are pointed to sky and some leave a reduced square platform open to sky denoting that the soul absorbs itself into the Nirguna tattva (state of the Unqualified Brahman). Some have straight vertical staircases and some have spiral staircases to reach the top platform. The earliest (The Ziggurats of 4th millennium BC) have four platforms facilitating circumambulations at different heights (elevations) with straight vertical staircases on all sides while the later structures at other places vary in number of platforms (parikrama), for example Borobudur structure has seven platforms with vertical stair cases on all sides leading to the top. The basement of Borobudur is said to denote the seven Lokaas or material planes as our tradition says that there are seven Lokaas below the earthly physical plane and seven above it including itself. Earth being in the middle of the fourteen Lokaas is considered the pathway to the non-material planes of upper worlds. The architecture of later Hindu temples is pyramidal or conical in structure pointing to sky. They do not have platforms connected with staircases to reach to the top or Sikhara. But the Hindu tradition gives much importance to circumambulating a temple with oordhva drishti concentrating on its Sikhara. Sikhara darshan of a temple is considered more than sufficient even if one could not have the darshan of the deity inside the Garbhagriha (for example, Balaji temple in Tirumala and Sri Mallikarjuna temple in Srisailam). In spiritual practices also, a saadhak is supposed to raise his consciousness through the six Chakraas from Mulaadhaara to reach finally the seventh, i.e., Sahasraara. Since the temple tradition is still intact and alive in India since the remotest past and all other popular religions of the modern world have only congregation halls or open yards as the case may be for conducting the community prayers, not subscribing to the theory of evolution of man and transmigration of soul, the Hindu philosophy based on ancient Bharateeya literature and in turn the Vedic knowledge might help us in understanding the social and spiritual philosophy of these symbolic pyramidal structures which were very popular in the ancient civilised world. Aryan Culture defies the modern definitions of ‘culture’ which state that the ‘culture’ is evolved in course of time and that it relates to a community or an ethnic race or people living in a well-defined geographical region or a nationality or a religious creed. Instead, Aryan Culture transcends all such descriptions and attempts to discipline the social conduct, personal character and moral psyche of a man. The epicenter of this great Culture is located in the region south of Mount Kailas and extended to the Sarasvati-Sindhu-Ganga plains popularly known as Aryaavarta according to our Puraanic literature. Further the Puraanaas say that the Aryan Culture is not an evolved one but it is handed down to the humanity by the Brahma-maanasa-putraas. The Aryan Culture is based on the Eternal Dharma, which is revealed through the Veda. The Rishis who enlivened this great Culture through their exemplary lives had revealed the secrets of this Creation and the meaning and purpose of human life according to which the ultimate goal of a man is to getting himself liberated from the cycle of births and deaths and finally absorb himself in the Brahman. Aryan Culture provides various spiritual paths, which are proved to have been successful in taking an ardent follower to arrive at the avowed destination. Each individual enjoys virtual freedom to choose his spiritual path among the numerous ways proposed by the Aryan Culture depending on his capability and interest. 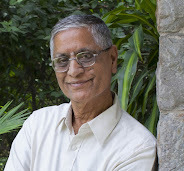 The one who realises that the aim and sole objective of his life is to attain the ultimate state of Brahmam and pursues a spiritual path of his choice or follows the path prescribed by his spiritual master while leading the life based on the Eternal Dharma as enunciated in Aryan Culture is addressed with the honorific epithet of ‘Arya’ in ancient Bharateeya literature. Though an individual enjoys complete freedom in his choice of a spiritual path, he is bound by several dharmic injunctions in matters of his interaction with his family, society and community. A number of Smritis and Sastraas based on Sritis have come into being in course of time to satisfy the changing needs of the society. As the main objective of Aryan Culture is to make man realise his goal and put him in an appropriate path to reach it, a comprehensive and evolutionary model is proposed for the life of an Aryan which is symbolically shown in the ancient pyramidal structures. The four sides elevating to top in four phases represent four facets of Aryan living, viz., A) Varna, B) Ashrama, C) Veda and D) Purushaartha each prescribing four grades of evolution to be achieved by practice as shown in the following model which could be considered as the basis of the ancient pyramidal structures. Aryan Culture addresses an individual to become Aryan rather than attempting to the stratification of society on the bases of birth, colour, creed, gender, age, race, language, profession or occupation, geographical region etc. The transformation of Varna system into Caste system by the Saastra period and into Casteism in the recent historical period and the discrimination of one against the other on the basis of birth has been periodically condemned by the social and religious reformers in our country at least from the days of epics. The Aryan Culture declares that every one is a Sudra by birth and through various Samskaaraas he achieves Brahmanhood not necessarily in different lives permitting interchange or downward or upward mobility in Varna in one life and that every creature is eligible to get Moksha. Puranaas give several examples of non-human creatures like spider, elephant, and serpent merging into Lord Siva. Bhagavatha Puraana also gives several examples of evil-minded and egocentric Raakshasaas getting merged in Lord Vishnu. The God also had taken non-human and partially human forms for His incarnations. Thus any creature with one of the nine kinds of Bhakti if pursued sincerely in word, deed and thought, is certain to achieve its ultimate Goal in the same life. Even Dharma or religion or social obligations or family duties can not hinder an individual’s progress in his chosen path of Liberation with singular devotion to God as decreed by Lord Krishna in the Gita. But all such cases are exceptional, which can not be applied commonly to every one. It is only suffice to know that the Liberation is not the forte of only those who are blessed with great qualities or capabilities or scholarship or serious spiritual mindedness or pure religious and social conduct. However, Aryan Culture also cautions that jumping the krama-mukti maarga might land any body into serious troubles. Therefore, Aryan Culture has handed down to humanity a steady and sure path to the Liberation, no matter how long it takes one to reach his Goal following the path of Dharma and also enjoying the beauty of life simultaneously. As a tradition, the Aryan Culture suggests a gradual evolutionary path for an individual. · Every human being is a Sudra by birth and the term denotes the preparedness of an individual to serve the society with dignity of labor. He begins his life adopting Brahmacharya to learn Scriptural knowledge for understanding the Dharma, the first Purushartha by serving his master. This stage forms the concrete basis of ones life before he actually sets his career in motion. · In the second stage, he adopts the qualities of Vysya to engage himself in remunerative pursuits like agriculture, business, employment, trade, art etc according to the injunctions of Dharma by entering family life as Grihastha to discharge his duties to his family, society and his country and practicing his scriptural knowledge as enunciated in the Braahmana thus fulfilling his material objective, i.e., Artha, the second Purushaartha. · In the third stage, he exhibits exemplary bravery, the quality of a Kshatriya, to leave the comforts of life to live in forest ( such high quality was exhibited by Mahavira, the Jina, the Conqueror of Desires, and Gautama, the Buddha, the Enlightened One in respect of the implications of Desire, in historical times), and to acquire the inner meaning of the Braahminic rituals through the Aaranyaka enabling him to win his sensual yearnings, Kama, the Desire, to reach the level of contentment with regard to the worldly life. On the other hand, this stage consolidates his efforts to strongly desire for desirelessness only. · The fourth and final stage makes him a real Brahmin whose only desire is to merge in Brahmam by taking to Sanyaasa and sitting close to the realised Masters to quench his thirst for the philosophical understanding of the Tattva, the Upanishad, as he waits for the Moksha, the last Purushaartha. Thus the essence of Aryan Culture is to prepare an individual to attain the four Purushaarthaas, one after the other, through the four stages of his life with the Veda holding the torch and the Varna providing appropriate qualities at each stage. The Aryan Culture basically addresses the individual and through him the society at large. The present Hindu temples or the ancient pyramidal structures irrespective of the religions they profess are designed to exhibit the conduct and philosophy of life of a human being in a symbolic manner. These structures provide necessary motivation, inspiration and guidance to the seekers of Truth if they could firmly establish the graphic presentation of this picture on their mental plane. * The author expresses his deep sense of gratitude and indebtedness to Sathguru Sri Sivananda Murty garu of Bheemunipatnam, AP for his understanding of Aryan Culture. All comments are approved at the sole discretion of the moderators.